Start your Journey to the Holy Land. where you will be walking on the land and footstep of Jesus. Arrive in Israel at Ben Gurion Airport where we will be met by our representative . Meet your Israeli tour guide and travel with private Bus to hotel in Tel Aviv on the coastal area. The remainder of the day is free to walk along the Mediterranean (the “Great Sea”) beach and enjoy the restaurants. Caesarea, the harbor town of king Herod of Judea, where Gentiles first heard the Good News from Peter. Visit the theater, bath house, harbor area, the Stone of Pilate and the aqueduct. Mt. Carmel, where Elijah challenged King Ahab and the prophets of Baal. The Jezreel Valley to Megiddo, the Armageddon Battlefield. Tiberias area on the Sea of Galilee. Dinner and overnight lodging in the Kibutz Hotel D/B. Tabcha, where the miracle of the fish and loaf took place. Capernaum "the town of Jesus" where most of Jesus’ miracles in Galilee were performed. Visit the site oft Peter’s home. Visit Nazareth and the church of the announcement. The biblical town of Dan where the children of Israel fell to the depths of pagan worship. Traveling southward to Beit-Shean-Scythopolis,the archaeological site where King Saul and his sons bodies hanged by Philistines on the walls of Beit-Shean. Following the Jordan Valley southward into the desert agricultural miraculous restoration of the “Land of Milk and Honey". Pass ancient Jericho, view from a distance this city famed as the oldest in the world. Qasar El Yahood Beyond the Jordan, the place where Jesus was baptized by John the Baptist, where Elijah and Elisha crossed the Jordan. Drive the Dead Sea – the lowest place on earth. Spend time in the special spa and enjoy a dip in the Dead Sea for a relaxing float before dinner. Visit the fortress of Masada, the place of the last stand of the Jewish defenders against the Romans. Ein Gedi oasis, where King David hid from Saul in the cave. Visit Qumran Caves where the Dead Sea Scrolls were discovered. On the way to Jerusalem we take a trip back in time in "Genesis Land" enjoins Biblical dinner in Abraham's Tent. 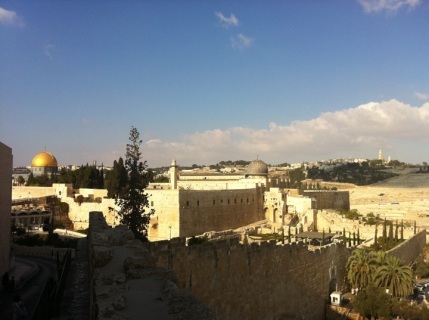 Begin the first day in Jerusalem with Thank GOD PRAYER on Mount Scopus facing panoramic view of the city, Mount Moria and the Dome of the Rock where the Temple stood for 1000 years. Garden of Gethsemane. Get a glimpse of Jesus walking between the ancient olive trees. Western wall Tunnels leading us through the Second Temple era. Santa Anna- Pool of Bethesda, Stephen's Gate. The City of David on the southeastern hill below the Temple Mount in. The new excavations of the City of David. Gihon Springs, the original water source for Jerusalem. Water walk through Hezekiah's Tunnel to the pool of Siloam, the place of Jesus' miracle in (John 9). Walk through the Temple Tunnel links the City of David and the Temple mount (newly open to the public). Visit the ruing of the second temple by the Southern Wall. King Zedekiah Cave to celebrate communion and a time of praise. The "Upper Room" just outside the Zion Gate where later Thomas cried, "my Lord & my God." The Shrine of the Book where the Dead Sea Scrolls kept. Yad Vashem, the Holocaust Museum. Fare well Dinner and transfer to Tel Aviv Ben Gurion Air Port. On your way home Start very early A.M departure for the Tel Aviv Airport for our flight homeward will allow for arrival home by early afternoon. On top of all brought to you in the itinerary above which emphasizes the spiritual aspect of this miraculous country, our guides are experts the return of the Jews and the restoration of the state of Israel. Many topics such as: politics, military, education, and other cultural aspects, will be woven into the commentary in order to give you added value to your experience.